April 2017 saw the launch of the Art Partners campaign at Harrods. Brands steeped in British tradition and heritage have teamed up with contemporary artists and designers, and the resulting range of furniture and home accessories encapsulate the idea of modern collectables. British designer Charlotte Olympia Dellal is renowned for creating ultra-feminine shoes and accessories. Drawing upon old-Hollywood glamour, with a touch of British eccentricity, her creations for her brand Charlotte Olympia include the Kitty flats and Dolly platform heels. 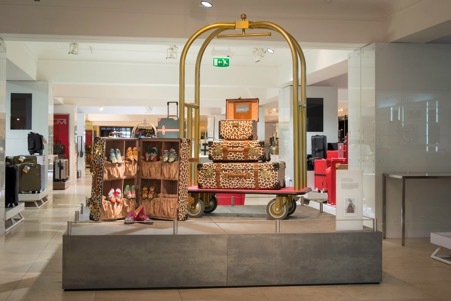 In Globe-Trotter, Charlotte Olympia has found the perfect partner. 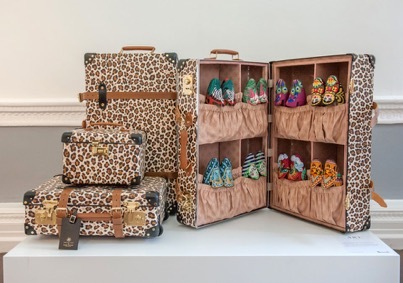 Together, the two have created a leopard-print luggage collection, which includes, naturally, a novel shoe case. Also in the range: a large suitcase, a trolley case and a vanity case. A launch event was held at the Institute of Contemporary Art on 30th March, where VIP Harrods customers were invited to preview the entire Art Partners collection. 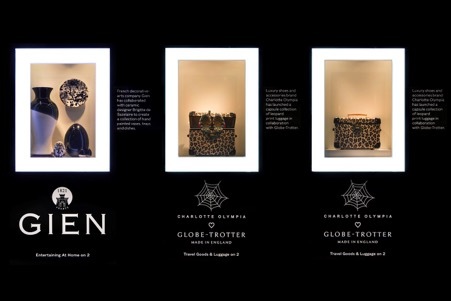 Following the launch, two of the limited edition vanity cases were displayed in the Harrods windows on Brompton Road.